Great results with Darwin in October. We did 50km on Bodmin Moor which he flew around and then headed up to the New Forest. We were in an 80km (50 mile) class, he went so well and won his class, super impressed with him as he’s 20 years young. Think his EquiGlo is helping to keep him going. 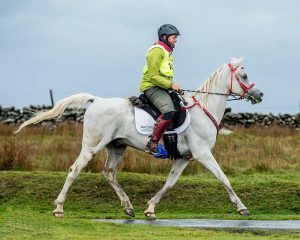 Darwin is sporting his EquiGlo pad in the photo from Bodmin Moor. My mare Latifa was ridden by a friend at the same two events. She also flew around both, she has now qualified to race so that will be something to look forward to next season. Very proud mummy. We have some indoor events coming up which I will take my young horse Bella to, so she can see the world a bit.